I have been ordering seeds and it is always worth getting your seed order in before Christmas (you might still have some money, the seed companies will hopefully not run out of what you want and it takes your mind off writing Christmas cards). So it seems like the right time to mention some new seeds that are available in the UK. I did my seed order for Plant World Seeds last night and I love this small catalogue (and much bigger website). The company is run by the enthusiastic Ray Brown and you can visit his garden in Devon and see the plants in flower – yes the seeds are produced by Ray and his team, something that is pretty unusual these days. As well as offering seeds of rarities he has collected from around the world, Ray’s garden and keen eye have produced some notable new plants that are now commonplace such as agastache ‘Golden Jubilee’. Anyway, here is my pick of what is new or interesting for this year. 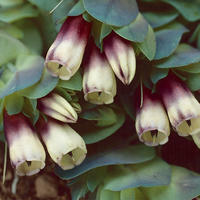 The genus cerinthe is best known in gardens as Cerinthe major ‘Purpurascens’ which is a quick growing annual with blue grey leaves and purple flowers more or less enclosed by dusky purple bracts. The leaves are often mottled and spotted with white which can worry some people because it looks a bit like mildew. The seedlings do not like transplanting so sow them individually in small pots, no earlier than late March so you can plant out strong, young seedlings in late May, after the last frost. 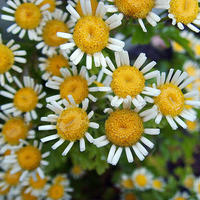 These plants love full sun and well drained soil and, if they are happy, they seed around too. I love the look of this one with those blackberry and cream (sorry Ray) and I have some seeds on the way! Bees love these flowers too (the are not called honeywort for nothing!) though bumblebees often bite holes in the back of the flowers to rob the nectar. I am ashamed to say that I have not deliberately grown feverfews for a good number of years and the normal green and the yellow-leaved are very good garden plants. They are shortlived perennials that are good for cutting, nature-friendly and usually they seed around gently. Ray’s selection of rare kinds got me excited enough to order a packet of each. This one with the rather gappy grin is called ‘Malmesbury’ after the place it was discovered. I can hardly wait to see it in bloom. Ray crossed (or a bee did the job) his two most amazing silenes: ‘Ray’s Golden Campion’ with ‘Purple Prince’ and the result is a plant that has golden leaves with a purple edge – no great surprise there. I really don’t like yellow and pink but I really fancy this one. 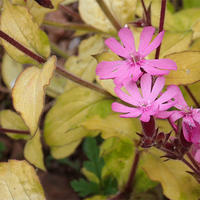 Silene dioica is one of our most garden-worthy weeds and the addition of coloured foliage makes it even more desirable. Berberidopsis corallina (in the family Flacourtiaceae and from Chile) is one of my favourite twining climbers, ideally planted in moist shade where it is evergreen, fairly quick growing and spangled with round, deep red flowers in late summer. Nothing else looks like it. 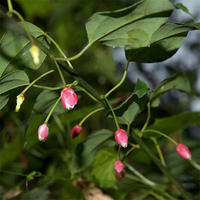 Well, this new berberidopsis from New South Wales, Australia is a bit like it but the flowers look less round. It looks exciting. 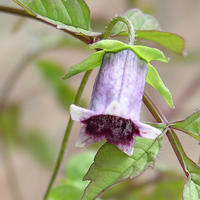 I first fell in love with codonopsis when I was on exchange at the Edinburgh Botanics and had a stint weeding the rock garden. I remember two things vividly. Firstly the rule that we could not, under any circumstance, tread on the soil so we had to leap like chamois from rock to rock. And secondly I remember the gaseous smell that so obviously identified the position of codonopsis. These climbing campanula relatives have a subtle charm and the flowers, which although usually bell-shaped can be starry, are almost always intricately marked and worthy of intense observation. This one is a low twiner and would grace any garden. 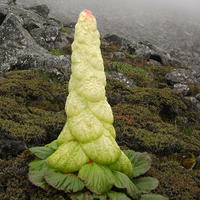 If you have ever read books about plant hunting in the Himalaya you will have seen photos of this remarkable rhubarb with huge white bracts on the flower stems that protect the blooms from cold and wet and, probably, provide a nice retreat for pollinating insects. This is a plant for the patient gardener who has impeccable taste. Viscaria oculata is not that unusual but Ray says that this single-coloured strain is very rare and it is certainly beautiful. 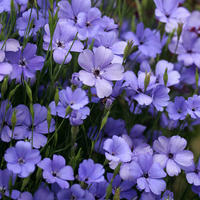 Viscarias are easy to grow and flower for a good while in summer and this is one of the most delightful hardy annuals you can grow. 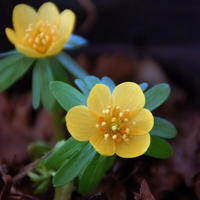 These seeds are collected from the pale orange flowered winter aconite and should come true to type but there is always a risk with seeds of cultivars. But these named eranthis are rare and expensive and this is a good way to get something very very special if you are prepared to wait a few years for flowers.